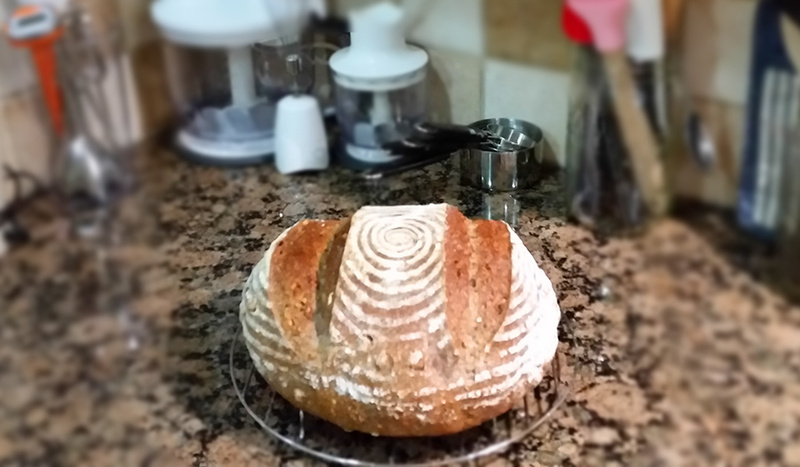 Formed the dough into a boule and put into a bowl and lid on , let it sit at room temperature for 2 hours and put it in the fridge for 10 hours. In the morning I degased the dough , shaped into a boule, put in floured banneton , wraped loosley in a cotton kitchen towel and put in a plastic bag and off it went in the fridge to proof for 12 hours. Baked it as usual in my dutch oven with the lid on at 250C for 30 minutes and with the lid off at 200C for a further 20 minutes. Managed to let it cool before slicing * but it was still ever so slightly warm :)*. Looks amazing! Perfect crumb and crust for this type of bread. I love walnuts so I'm sure I would like this one. loves most food and ALL the bread that I bake * that is labrador for you * but today, I gave him a slice of this one, he was happy, took the bread and gave it one chew spat it out and left. That might be walnuts. Some dogs react to them or have had a bad experience with a bad nut. husband and kids loved it too, was gone in no time. I think next time I make a double batch. Reg. my dogs reaction to the walnut, I just googled it and never knew this about nuts. OOo... that looks great, Petra. Would you mind if I featured this one on the homepage for a bit? What a beautiful loaf, crumb and crust. I'm with you on just a slice with unsalted butter. (my mouth is watering) Congrats on the front page... nice "eye candy." I think I'll add this one to my to-bake list. That list is getting long... I better get to baking more bread. Great job. Can eat it off the screen! This bread looks amazing! Will try to make it. 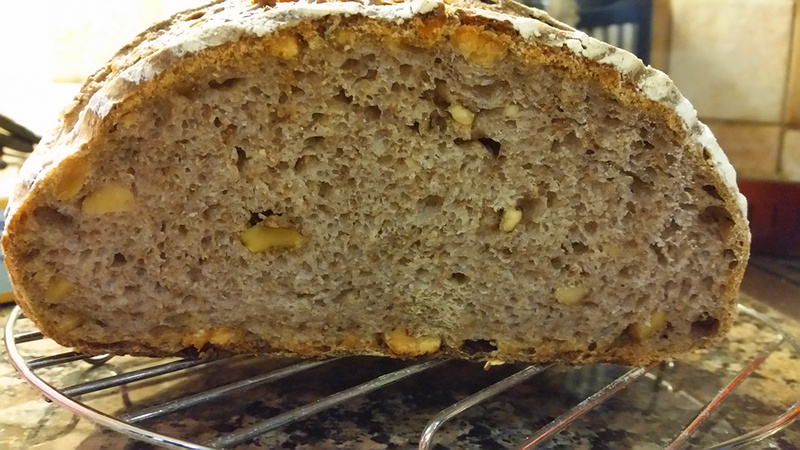 This walnut bread looks really great, congratulations Petra! Its been a while since I made a walnut bread, now I feel inspired to bake one! I bake one tomorrow,it is proofing in the fridge right now. That looks really great - I am sure it went fast. It really is one of our fav. Sourdough breads.